Home of France’s No.1 links, Le Touquet Golf Resort, and sister venue, Golf d’Hardelot, are among the four venues on France’s northern coast celebrating 25 years of Continental Europe’s largest Pro-Am tournament, The International Opal Coast Pro-Am, 24-27 April 2019. The format of The International Opal Coast Pro-Am, which is also France’s oldest Pro-Am tournament, has remained unchanged throughout its 25 years, taking place across four days, on four golf courses, and hosting around 400 players each year. Professionals and amateurs travel from France, the UK, Belgium, Luxemburg and the Netherlands to compete for a prize purse of 73,000 €, working their way down the Opal Coast as they play courses at Le Touquet Golf Resort, Golf d’Hardelot, Belle Dune Golf Course and Wimereux Golf Club. Le Touquet Golf Resort and Golf d’Hardelot are easily reached from the UK, Belgium and The Netherlands, as well as the rest of France, by road and rail; both located less than an hour’s drive south of the Eurotunnel terminus on the A16 autoroute. 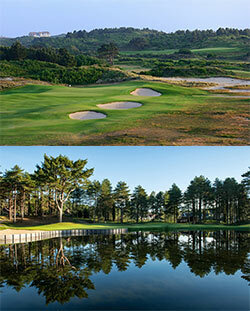 Le Touquet Golf Resort is home of France’s #1 links course, La Mer. The classic 1931 Harry Colt design and lost holes have now been exquisitely restored. La Mer ranks at no. 31 in Golf World magazine’s Top 100 Golf Courses of Continental Europe ranking and 35th in Top100GolfCourses.com’s Continental European listing. Europe’s most fashionable resort of the ‘Roaring Twenties’ and 1930s, Le Touquet remains an iconic destination blending elegant style and architecture with wide, open sandy beaches, surrounded by pine forest. Today, with the contemporary comforts and hospitality of a new architect designed clubhouse and the transformation of Le Manoir Hôtel into a boutique style establishment, Le Touquet Golf Resort and its three courses is ushering in a new golden age of European golf travel. Golf d’Hardelot is 10 minutes from the centre of Neufchâtel-Hardelot on the north east coast of Pas-de-Calais, France’s northernmost department. It boasts two superb 18 hole courses, Les Pins and Les Dunes. Meandering through dunes and forest, these two sand-based layouts offer great fun for all levels of player. Les Pins was designed by Tom Simpson and opened in 1931. It features at no. 24 in Golf World magazine’s Top 100 Golf Courses of Continental Europe ranking and 23rd in Top100GolfCourses.com’s Continental European listing. Les Dunes was opened in 1991. Designed by the late Paul Rolin and Jean Claude Cornillot, it has also undergone significant restoration work to offer a contrasting golfing challenge, while catering for the increasing demand from international golf visitors. Open Golf Club is a leading international golf management group, based in France. Founded in 1987, it now provides services to 50 golf clubs in six countries in Europe, including France, Belgium, Spain, Portugal and Italy.